The Texans were defeated 27-0 on Thursday night, as the New England Patriots handed them their first loss of the 2016 season. Turnovers plagued the Texans, who fumbled on two kickoff returns. The Patriots scored 14 points off Texans giveaways. Brock Osweiler and the offense struggled as the Texans were shutout in the regular season for the first time in 13 years (Jacksonville, 12/7/03). Osweiler completed 24-of-41 passes for 196 yards and threw one interception. DeAndre Hopkins led all Texans receivers with four catches for 56 yards. Lamar Miller contributed 107 yards from scrimmage, (80 yards rushing, 27 yards receiving). 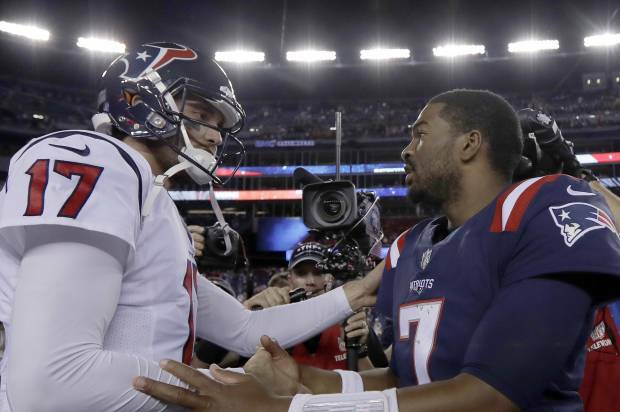 Rookie Jacoby Brissett made his first career start for the Patriots and was 11-of-19 for 103 yards, while also running for 48 yards and one touchdown. LeGarrette Blount rushed for 105 yards on 24 carries and scored two touchdowns, both in the second half. The Texans defense was led by linebacker Benardrick McKinney who had a team-high 16 tackles, one sack, one quarterback hit, and one tackle for loss. New England scored first on a 24-yard field goal by Stephen Gostowski with 2:07 left in the first quarter. A fumble on the ensuing kickoff return by Charles James II gave the Patriots possession at Houston’s 22-yard line. Two plays later, Brissett scored on a 27-yard touchdown run and New England took a 10-0 lead.